Perfect seasoning is the secret to fully appreciating the flavour of fish, but it’s not always that easy to get it right. 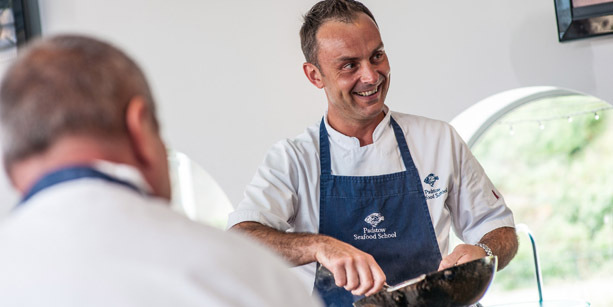 Mark Puckey, head chef lecturer at Rick Stein’s cookery school shares his top tips of how to season fish. 1) Always use a good quality salt. I would recommend using Cornish Sea Salt or Maldon Salt. Cornish Sea Salt is very salty so you don’t need to use a lot of it and Maldon Salt is a mild salt and is great for sprinkling. It also melts nicely on the tongue. 2) Don’t season fish too far ahead of cooking. Salt extracts moisture which causes the fish to dry out. 3) Try not to use pepper as the main form of seasoning, the flavour can be very strong and overpowering when added to a delicate flavoured fish. I also recommend adding pepper towards the end of cooking because it can burn easily. 4) Gradually season your dish throughout cooking as this will allow you to adjust it to your taste. 5) Use less salt if you’re cooking fish in a sauce because it will intensify as the sauce reduces. If you’re in need of a little recipe inspiration, sign up to our monthly recipe newsletter. Good advice, particularly in regard to the over-use of pepper whilst cooking. The Cornish sea Salt from Waitrose is divine and far too good to be used in cooking! Just sprinkle a few crystals on cooked food and appreciate what the finest salt does to enhance flavour.